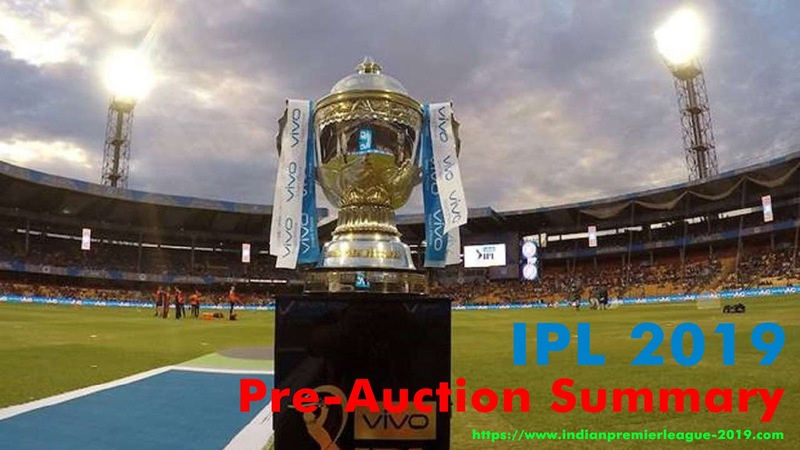 IPL 2019: full pre-auction summary of Indian Premier League 2019 [Source-Wikipedia]. There is every detail of Retained, Released, Transferred in/out Players with Team budget, remaining funds and Maximum Player slots remaining. There is a simple rule which should be followed by all 8 teams and Franchises. Check out the list of retained and released players in IPL 2019. Any Franchise or a Team can include maximum 8 overseas players in the squad. Every team has the same budget of ₹82 crore. In a Squad minimum player are 18 and the maximum is up to 25. Here there is complete pre-auction summary of IPL 2019 auction. Check out all the pre-auction summary 2019 given below. One of the best IPL Team 2019 and my favorite team Chennai Super Kings retained 23 players from the last squad so they have now 2 players slot remained. For 23 retained players they used ₹ 73.6 crores from the fund and now ₹ 8.40 crores left for auction. In the IPL squad list 2019, CSK released 3 Players from the team. Check out the list of retained and released players in IPL 2019. Delhi Daredevils released 10 players and retained 14 players from their squad list. The franchise transferred in one player for ₹5.2 crore and also transferred out 3 players for ₹5.2 crore. So they have maximum 10 places for players which can include a maximum 3 overseas players in the squad list. DD used ₹ 51.3 crore funds out of ₹ 82 crores. Check out the list of retained and released players in IPL 2019. Kings XI Punjab released maximum players which are 11 players out of 25 players. Only 9 players were retained in the squad list for ₹ 44.4 crores out of ₹ 82 crores. They have ₹36.20 crore left for selecting 15 players more which includes 4 overseas players. They traded for 1 player in exchange of another player for ₹1.4 crore. Check out the list of retained and released players in IPL 2019. Traded Players: 1 player traded in exchange of 1 another. Kolkata Knight Riders have 13 retained players in their current IPL squad list 2019. They released 8 players worth ₹ 15.02 crore. So they have 12 players slot remains which can include a maximum of 5 overseas players. Check out the list of retained and released players in IPL 2019. Another Big Team Mumbai Indians retained 17 players from their past squad and 10 players excluded from the squad list 2019. They have ₹ 10.64 crore budget for purchase maximum 7 players includes 1 overseas player. The franchise used ₹68.55 crore for their retained players. Now they have ₹10.65 crores available to buy 7 other players. Check out the list of retained and released players in IPL 2019. Rajasthan Royals expended ₹ 61.05 crores for 16 retained players. They released 9 players worth ₹ 18.3 crores. They have overall 9 more slots available which can include maximum 3 overseas players. Check out the list of retained and released players in IPL 2019. Royal Challengers Bangalore (RCB) retained 14 Players and released 9 Players and traded for 1 player in exchange of 2 players. They have more 10 slots available to buy another best players from the Squad list. The total budget they used around ₹ 57.65 crores. Check out the list of retained and released players in IPL 2019. Most adorable Team Sunrisers Hyderabad (SRH) released their 8 most precious players which are worth of ₹9.8 crore and traded 3 Players in exchange of 1 player. They have 5 slots available with 2 international players. Total used budget is ₹ 65.35 crore and available budget is ₹ 9.7 crore. Check out the list of retained and released players in IPL 2019.